Romanians love raw garlic with their food: you might know this by now if you've followed my recipes. One other thing I personally like is spiciness. I particularly felt in love with the spicy chili crisp used in the Chinese cuisine: it has crunchy texture, great flavor, and it always leaves me craving for more. One day, I thought about introducing this spice into a Romanian-Asian fusion dish. And what is more Romanian than our quintessential defense-against-vampires potion? 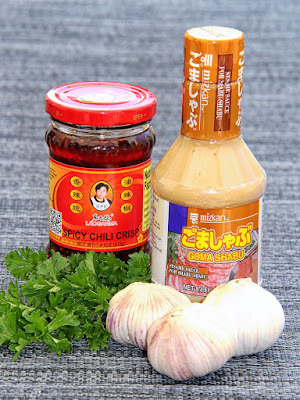 So, there you have it: a traditional Romanian garlic sauce, with a generous drop of Asian spiciness, all brought together by an oriental sesame sauce. I thought sharing a pic of the ingredients would ease finding them in stores, so here it is. You may want to look up the sesame sauce and the chili crisp in an Asian grocery store or online. I always use the Lao Gan Ma brand (it translates to Old Godmother , and she really knows how to do it well!). - Peel and crush a couple of garlic cloves. - Finely chop a bit of fresh parsley. - Now you have all the ingredients ready. The presentation looks better if they are not mixed yet, in my opinion. - Carefully place the ingredients in a smaller bowl. The ingredients have a nice variety of color, so you don't need to do much else. - I believe this recipe goes extremely well with a juicy meat, like a roasted chicken. For a fun presentation, you can sneak the garlic sauce bowl among chicken pieces on a larger plate (like in the photo above). Yummmmm, I've been using the spicy chili crisp on everything... including a roast chicken last night!